I help maintain an extremely complex application for the Department of Health and Human Services in the great state of Maine. I love writing code on the front-end in PowerBuilder and on the back-end using PL/SQL. I would be remiss if I didn’t mention the incredible people I work with. I am an extremely lucky person and enjoy the work that I do very much. I’m always learning something new which feeds my insatiable desire for knowledge. Nate LaClaire begins his new job as Assessment Associate for the University of Maine at Augusta on March 21, 2016. He will support CIS, Aviation, and other academic programs. His duties include support for faculty and students with the aviation simulator module; the online student orientation program; data science needs. Additional responsibilities include: supporting the growth of UMA’s Aviation program; managing the 3D lab, analyzing academic needs and requests; generating complex reports, queries, and extracts; serving as a technical resource to staff in answering questions, addressing concerns, and/or making recommendations for reports and products. Justin Wiley, a 2014 graduate with a Bachelors in Computer Information Systems has accepted a full-time position with ComResource (an IT consulting firm) in Columbus, Ohio, as a research analyst and SQL developer. He has also been accepted into the Predictive Analytics master’s degree program at DePaul University in Chicago. All of this is possible because of my education from UMA. Kevin officially graduated in December 2013. He was on the Dean's list every semester of his college experience. While he was in the CIS program, he participated in two internships: one with Maine Machine Products Company and one at Winderosa. Both companies were impressed with his information technology skills and his work ethic. He worked for a short time at RSU 10, when a career opportunity opened at New Page paper mill, he made that move. Kevin is also the developer of KW Products, an online store that sells retail items online. In 2002, he was selected as an ambassador for the Millennium Dreamers for his charity work. He received his Eagle Scout in 2006. He continues to be involved in the community as a volunteer for the Boy Scouts of America, helping them with merit badges and other scouting events. He plays music for shut-in and nursing home residents. He also assists with Youth Group activities and provides transportation for 12 children to attend Sunday school. Kevin took many of his classes online, and his instructors have commented that he stood out because he was always so polite and thanked them for taking time to assist him. We expect that Kevin will stand out in his professional career as he has in his academic career. Venessa Fredette graduated from the University of Maine at Augusta with a B.S. in Business Administration w/concentration in Computer Information Systems in 2009 and a Post Baccalaureate degree in Computer Information Systems from UMA in 2011. In March of 2012, Venessa became a Certified Scrum Master. In 2012, Venessa applied to graduate school at Boston University and in May of 2016, graduated from Boston University with a Master of Science in Computer Information Systems w/sub concentration in Information Technology Project Management. In August 2016, Venessa earned Project Management Professional Certification. Marcia Moore, a 2011 graduate of the CIS program, is currently employed by the Office of Information Technology (OIT) for the State of Maine. She is enjoying her position as a vulnerability tester (ethical hacker) and is sharing her expertise with current students. When I started tweaking the code in the website we had designed trying to get it to be more functional. Career: Finding new and improved ways to manipulate the data more accurately and faster, saving both myself and my co-workers extra time and headaches. Helping people. Dream Job: Creating that perfect website that just pops. Sometimes when you design a site, it is just OK; but other times, it just says "THIS IS IT" and that is the most satisfying feeling. I love to come up with new ideas that give each customer a unique, reasonably priced website. Use all the resources available to you. Code can be written many ways, check the internet for code already written if you are having a problem. Work with fellow students when you can. A different perspective often helps. My family and the staff at UMA. My family worked around my crazy schedule and kept the house going while I holed up in my office with school work. The professors and staff in the UMA CIS program were by far the most helpful I have encountered in pursuit of my various degrees. Do not be afraid to explore the various fields available to you and take each class with an open mind. I was so certain I wanted to operate an eCommerce store but I found that it is much more fun to design websites and manipulate databases. If you are just starting out in your career, make sure that you pick something that is fun because it is a LONG time to retirement if you are bored or do not like your job. Martha (Marty) Williams graduated with a post-Baccalaureate degree in Computer Information Systems in May 2011. She is currently employed as an analyst programmer at University of Maine System Wide Services, in downtown Bangor. I took a course in Fortran using punch cards way back, a long time ago. I continued with my major at the time, and never liked working in that field. After a couple of false starts, I landed a job for a company that used an advanced word processor for bank automation tasks, then worked in financial services using business intelligence software, but we called it Lotus 1-2-3. For the next twenty years I worked in the IT field, but never a master of any one field. Then I discovered SQL at UMA. When I am working on a programming assignment, there is a great deal of satisfaction when I crack the problem, and get the proper result. The icing on the cake is when the person who requested it says, "Thank goodness, this is so much better!" Find what you like and focus on that. When I first started the CIS program, I wanted to do web work, or may be desktop support management, or network security, or programming. After taking courses in all of the above, I found I really liked SQL and the problem solving aspect of programming. The faculty at UMA really offered me the encouragement and excitement I needed to complete my program. Take advantage of every learning opportunity you have. Sounds trite, but do your homework! Read the chapters! Big hint: Go to the website of the textbook, and look for study guides. The more you study, and study for understanding, the more satisfying your work will be. 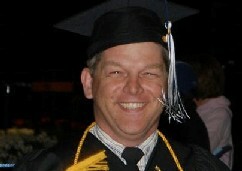 Bryon Sibley graduated with a Bachelor of Science in Computer Information Systems in May 2010. 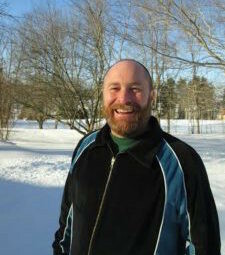 He is currently employed as the Assistant Information Technology Manager at the University of Maine at Augusta, Bangor Campus. In high school, computer programming was fun and interesting so I pursued a degree in electronics. The degree opened the door to work on electronic typewriters and word processors. The word processor soon evolved into the personal computer so as I continued my career learning more about servicing computer hardware. Eventually I found myself working at UMA servicing computers and peripherals. UMA offered a degree in CIS so I decided it would be to my best interest to obtain that degree. While I took classes, I worked 40 hours per week as well as maintaining family time. Providing good service, working with people and making sure the technology works the way it was designed to work is enjoyable. Learning new things is exciting, and with computers things are changing fast so the learning never ends. Patience! Computers do not work flawlessly, and everyone learns differently. Some people learn fast, while others may need something explained a different way. My family! I wanted my boys to see that hard work and commitment does pay off. Someday, after my boys are beyond college, I may pursue my Masters. Do not get discouraged. Some classes can be harder than others but you just need to work harder; find someone who has taken the class who may tutor you through it. Do not quit, lean forward and push through the storm. Things are brighter when the storm has passed. Dee Dee is a Distance Education Web Design Specialist at the Cutler Institute for Health and Social Policy at the USM Muskie School of Public Service where she provides leadership and administrative responsibility for the development, planning, management and dissemination of distance learning projects in collaboration with partners in the field of public professional development. Dave Pearson graduated with a Bachelor of Science in Computer Information Systems in May 2009. 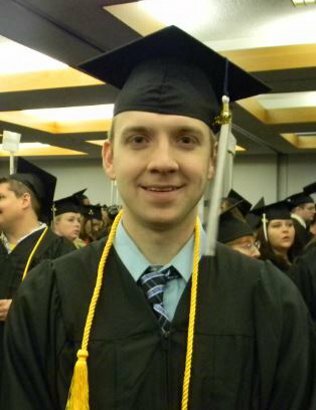 He is currently employed as a Software Developer /Analyst at Matthews Brothers in Belfast, Maine. Writing code that actually works and is in production and working with people and computers. The ability to tackle abstract problems and produce well-thought-out, well-planned solutions that work for the situation. Do what you love the most and what really gets you engaged. Put as much time into your coursework as you can. The more you put in, the more you get out. Most importantly, ask for help if you need it. Your instructors are there to help. Viel GlÃ¼ck! Find what you like and focus on that. When I first started the CIS program, I wanted to do web work, or maybe desktop support management, or network security, or programming. After taking courses in all of the above, I found I really liked SQL and the problem solving aspect of programming. Ahmed Abdi, a 2008 graduate of the Bachelors of Science in Computer Information Systems, landed a full-time position at BBVA Compass Bank, the second largest bank in Spain. He works as a VDI and Citrix Engineer Application Virtualization and Datacenter Infrastructure Designer in Birmingham, Alabama. Brian Oliver, a 2008 graduate of the BS in CIS, is the Team Leader of the Department of Administrative Financial Services Team for the State of Maine, Office of Information Technology. This team is responsible for the nightly Extraction, Transformation, and Load (ETL) process that collects information from the State’s Accounting and HR systems. The data is stored in an Oracle database for analysis and reporting purposes. Mr. Oliver’s team also maintains and develops a collection of business intelligence tools such as Microsoft Analysis Services and Microsoft Reporting Services to support business clients and partners in their analysis of the warehouse data.